The B.C. Rich Mockingbird Mk5 Set Neck Electric Guitar takes everything up a couple of notches with a carved maple top and coil-tapping. The mahogany body and neck are fully bound. The mahogany neck has elegant cloud inlays and heel-less neck joint pioneered by B.C. Rich for comfort and access to the upper registers. The headstock is also bound and features a beautiful Mother of Pearl script inlay. 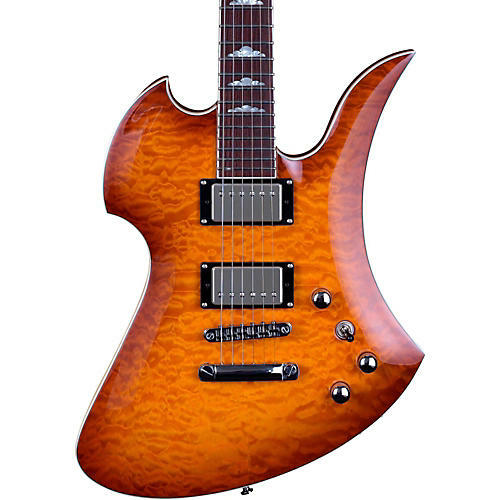 Electronics include dual covered humbuckers with individual volume controls, a master tone control with coil-tapping, and a 3-way pickup switch. A modern twist to the Mockingbird, the Mk5 comes with a T.O.M. style bridge and stopbar tailpiece. Case sold separately.